Hello everyone, I hope all is well with you. I’m back today as winter storm Xanto rains down on us here in the Midwest. I plan on getting a lot of writing done this weekend as I huddle beneath my blankey and wait out the storm. It’s supposed to be historic, and I’m praying for at least one snow day out of it. But enough about the weather, I’m back to talk about one of my favorite things in the world. Books. I’ve just finished a couple of great ones, and I thought I’d share them with all of you. The first one is a new to me author. I haven’t read any of her previous stories, but she has a great reputation so I thought I’d give her latest release a try. It’s a young adult story so if you have any teens looking for something to read, check her out. 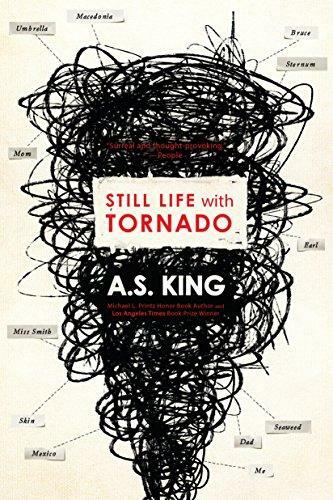 The title is “Still Life with Tornado” and the cover and blurb are below. Sixteen-year-old Sarah can’t draw. This is a problem, because as long as she can remember, she has “done the art.” She thinks she’s having an existential crisis. And she might be right; she does keep running into past and future versions of herself as she wanders the urban ruins of Philadelphia. Or maybe she’s finally waking up to the tornado that is her family, the tornado that six years ago sent her once-beloved older brother flying across the country for a reason she can’t quite recall. After decades of staying together “for the kids” and building a family on a foundation of lies and domestic violence, Sarah’s parents have reached the end. Now Sarah must come to grips with years spent sleepwalking in the ruins of their toxic marriage. As Sarah herself often observes, nothing about her pain is remotely original—and yet it still hurts. Insightful, heartbreaking, and ultimately hopeful, this is a vivid portrait of abuse, survival, resurgence that will linger with readers long after the last page. I didn’t get the title until I’d finished reading the story. Needless to say, it makes perfect sense. I loved the story. It’s about a family and how domestic violence affects everyone in the family. It’s told from two viewpoints and one of them is Sarah. The only person who hasn’t experienced her father’s fists. In the beginning of the story, she has lost the ability to create art. Her passion. She’s also no longer attending school and that has everyone worried. No one knows why and the story is intricately woven together as the author takes us through Sarah’s journey. We learn about her love for her brother who moved out and the incident that sent her into a spin and brought her world crashing down. The second viewpoint is Helen, Sarah’s mother. She’s a nurse and she’s the person stitching the family back together when her husband’s rages tear it apart. She doesn’t know what caused Sarah to slump into a depression, but she’s got her own issues to deal with. She’s the one who tries to keep her husband on an even keel and avoid his punches at the same time. She’s walking a tightrope so she isn’t able to give Sarah the attention she needs, but she’s trying. The one negative I have about this story is that I didn’t feel that the mother’s voice and Sarah’s voice were distinct enough. There were a few chapters where I was half way down the first page before I realized the narrator had switched. This pulled me from the story and created a. bit of confusion. We all know it’s a bad thing to frustrate our reader, but that’s the only negative I have. Otherwise, it’s a great read especially for teens. 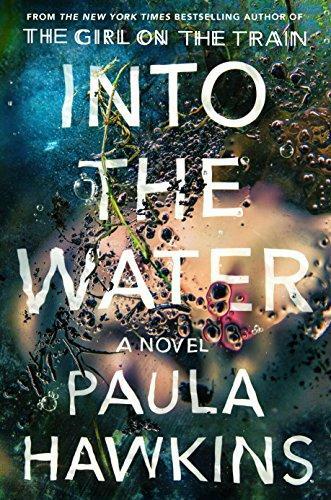 The other book I read was an adult suspense written by the author of “Luckiest Girl Alive.” This second story did not disappoint Its title is “Into the Water” and the cover and blurb are below. This one is written with a non-linear time line so you have to pay attention otherwise it gets confusing. It’s the heartbreaking story about a single mom who’s investigating some strange deaths in her town. She’s a photographer and she has become intrigued by the mysterious deaths surrounding the river winding it’s way through the tiny burg. Her daughter’s best friend commits suicide and her daughter, Lena, is the only one who knows why. Katie, Lena’s best friend, does this by jumping off the cliff and into the river. Months later it appears as if Lena’s mother, Lorna, has done the same thing. Lorna’s found dead in the river as well, and so the mystery begins. Did she commit suicide? Was she murdered? The story pulls you in and it goes deeper and deeper into the tragedies of this small town, revealing secrets and uncovering the ugly truth. It’s a great read and Paula Hawkins has just become one of my favorite authors. Thanks for stopping by and checking out my reviews. How about you? Do you have any great books you’d recommend? Leave a comment. I love to hear from you! Author Visits Are the Bomb!